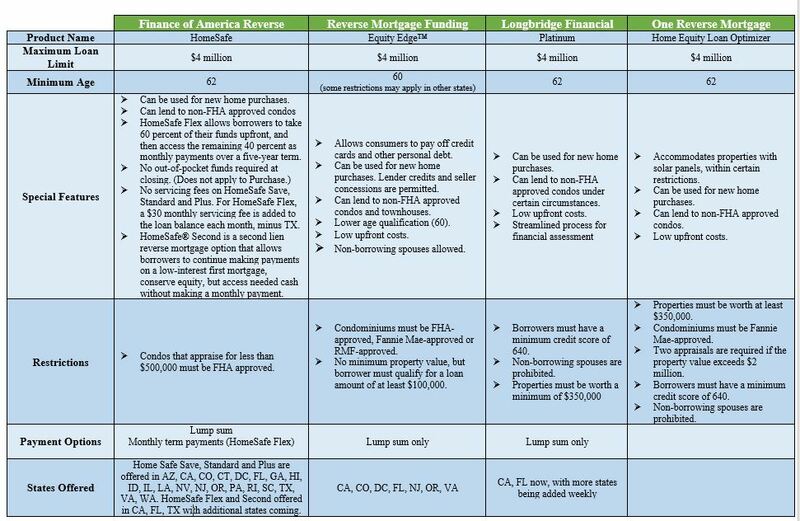 Finance of America Reverse this week introduced HomeSafe® Second, the first-ever second lien reverse mortgage and the latest addition to its proprietary HomeSafe suite of products. In an interview with Weekly Report newsletter, Scott Norman, vice president, Field Retail and Government Relations at FAR, said HomeSafe Second achieves two things. First, it opens up an entirely new reverse mortgage conversation for people who have not been exposed to the multiple benefits of the product. Additionally, it can be used by people who are still carrying mortgage debt and would rather continue making payments at a lower interest rate than what the traditional HomeSafe loan offers. HomeSafe Second is available through FAR’s retail and wholesale channels to borrowers in California, Florida and Texas, with additional states being added in the coming months. Because products change all the time, so will this chart. As new changes are announced, we will update the chart and distribute in future issues of Weekly Report.